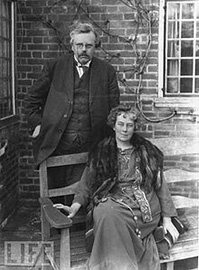 In the early morning hours of June 14, 1936, a wife and a world said goodbye to a husband and one of its most prolific writers and defenders of the Christian faith, G. K. Chesterton. By the time of his death, he had written around 80 books and now 80 years later we are still enjoying and being encouraged by that legacy along with his numerous short stories, essays and plays. Upon Gilbert’s death, Frances, his wife, received the following telegram from Cardinal Pachelli, Cardinal Secretary of State and Camerlengo of the Holy Roman Church, on behalf of the Pope…. Gilbert Keith Chesterton was truly a gifted defender of the Catholic faith, but in that, he also became much more to people of all Christian denominations: a common sense defender of Christ. We continue to quote him in our Christian witness to others 80 years later, and by Christ, even gaining some to the faith. In this house we have also been reminded of death recently and ourselves drew comfort in the face of that loss from the poem that occurs in Chesterton’s book, The Flying Inn – The Rolling English Road. The last two stanzas sum up that indescribable feeling we all have when its our own time to approach ourselves or watch another go or remember one who has already gone to that “decent inn of death”. It’s been a generation since Chesterton’s death. Only 81 years. And yet his encouragements and warnings are just as applicable today if not more so. Remembering a true friend to every reader and brother in Christ, a servant of the Lord on this day.